1. Add a dash of salt and pepper to coat chicken breasts. Dredge chicken in breadcrumbs, and shake off excess. 2. Heat a large skillet on medium-high heat. Add butter and olive oil. 3. Add chicken to the skillet and cook 4 minutes on each side, until brown. 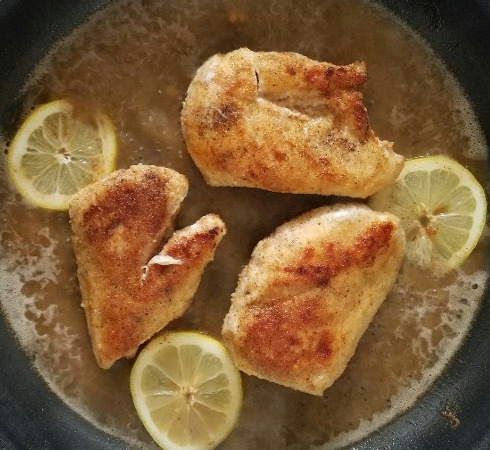 When chicken is fully cooked (internal temperature of 165F), remove from the skillet. 4. Take the skillet off of the heat and add lemon juice, stock/wine, and capers to the skillet. Stir to mix new contents with leftover oil, and return to the heat. Bring the liquid to a boil, add chicken back to the skillet and simmer for about 3 minutes on each side. 5. Serve chicken with a drizzle of the sauce and parsley to garnish. 6. Serve chicken with side of cooked whole wheat pasta and asparagus.